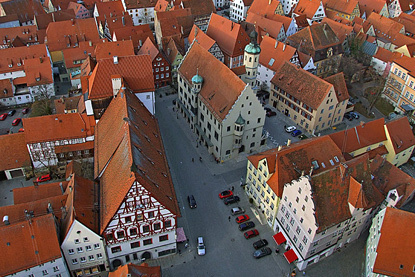 Nördlingen is the only town in Germany, along with Rothenburg and Dinkelsbühl, that has retained its complete city walls. The 90-metre tall clocktower of Saint George's Church offers arresting views of the circular town. Nördlingen lies within the Ries crater, a huge depression caused by a meteor impact 14 million years ago.